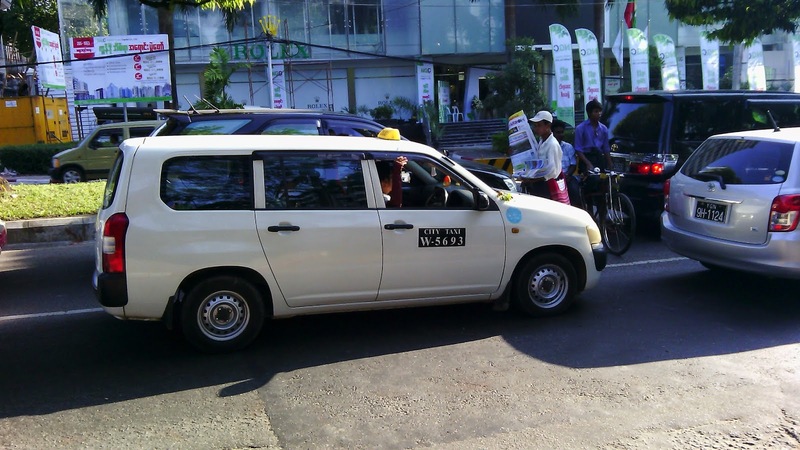 The Toyota Probox DX, the stripper version, is the backbone of the Yangon taxi industry. And taxis make up 37% of all vehicles. To be more precise, taxis make up 37% of vehicles (plus or minus 5%, 19 times out of 20) during the morning rush hour on U Wisara Road. Adjusting loosely for a bias in the timing of my sampling, taxies are not less than 25% of the car fleet here. I am puzzled by the enormous number of taxis. It may be a symptom of a rising middle class that would rather not use the old and often very full public busses, but hasn’t reached the stage of private car ownership. The benefit for a foreigner is obvious. Ready availability of cheap rides. The car fleet is relatively new. I would guess the average age of vehicles is 7 or 8 years. This is a major benefit in terms of smog. Cuba with way less vehicles manages to choke you with ill-adjusted carbureted engines and no-filter diesels. Yangon’s fleet expanded rapidly in the last four years, after the lifting of a punitive import duty. Japan’s second hand car market is the main supplier, hence the overwhelming market share of Toyota and the prevalence of computerized fuel injection systems. The traffic in Yangon is pretty easy to understand; less easy to navigate. The key principle is to take every opportunity to enhance your position in the melee, even if that means using part of the oncoming lane to reach an improved standing in the queue. Changing lanes is mostly done by presenting the vehicles in the other lanes with an increasingly hard to ignore fact. First, you stick your nose a little bit into the next lane, which will lead to the cars there to squeeze by you while riding their horn. And is there is a bit a gap, you nose further until the drivers in the other lane do not have enough room anymore to get around you. They will honk, but admit defeat. Have you tried crepe with meat yet?? Your description sounds an awful lot like the traffic situation we experienced in China in the early years, except probably multiplied tenfold and mixed in with bicycles, carts, pedestrians and donkeys. Toyota in the lead, they seem to have that position in more than one place in this world. I remember how they took over from the french carmakers in the Middle East in just a couple of years. Reliable and a bit overengineered to take the overload they usually experience. But like you state not able to stay away from the traffic jams! And that is slowing things down! So patience is the key even in a Toyota.